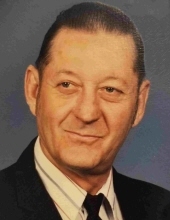 Harry Edward Jackson, 86, of Creal Springs, passed away Sunday, March 31, 2019, at Shawnee Christian Nursing Home in Herrin. Harry was a coal miner at the Ziegler mines. He was a proud member of the U.M.W.A. Harry was a Korean War veteran of the U.S. Army. He was a member of the Carrier Mills American Legion# 364. Harry was born May 25, 1932 in Royalton, IL to Harry & Lucile (Minton) Jackson. Harry married Lorene Conner Craig in 1987 at Assembly of God in Creal Springs, IL. Surviving are his wife of 32 years, Lorene Jackson of Creal Springs; son, David Jackson & Leitha Walker of Christopher; three step sons and daughters-in-law, Dennis & Kathy Craig, Leonard & Linda Craig, and Ronnie & Lisa Craig all of Creal Springs; numerous grandchildren and great grandchildren; sister, Delores Woodside of Chicago; several nieces and nephews. He is preceded in death by his parents; five step sons, Danny Wayne Craig, Cletis Craig, Jr., Harvey Craig, Donnie Craig, Cecil Craig; step daughter, Patricia Smith. Services will be 1:00 p.m. Wednesday, April 3, 2019 at Meredith-Waddell Funeral Home in Herrin with Rev. Bill Brandstatter officiating. Interment with military graveside rites conducted by the Marion V.F.W. Post # 1301 & American Legion Post # 147 and the IL Army National Guard Honor Detail will be in Creal Springs Cemetery in Creal Springs, IL. Visitation will be 11:00 a.m. to 1:00 p.m. Wednesday at the funeral home. Memorial donations may be made to Hospice of Southern Illinois, 204 Halfway Road, Marion, IL 62959; envelopes will be available at the funeral home. To send flowers or a remembrance gift to the family of Harry E. Jackson, please visit our Tribute Store. "Email Address" would like to share the life celebration of Harry E. Jackson. Click on the "link" to go to share a favorite memory or leave a condolence message for the family.